Gallia Academy junior Chasity Adams runs down a centerfield pop-up for an out during the third inning of Wednesday night’s softball contest against Athens in Centenary, Ohio. CENTENARY, Ohio — A tough night on the home front. 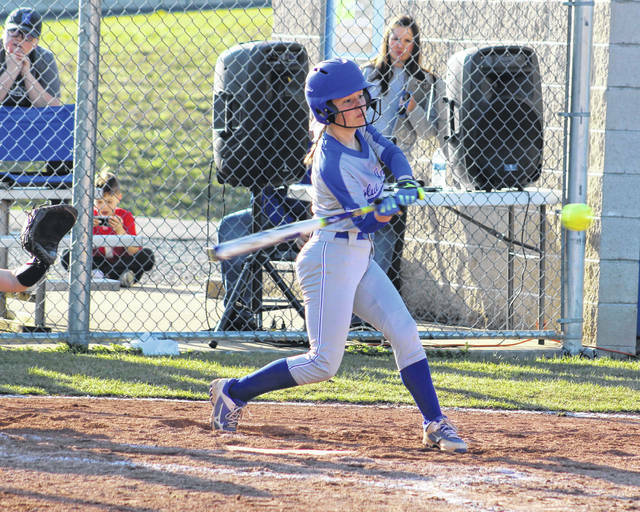 Visiting Athens built a 2-0 lead midway through the third inning, then tacked on three insurance runs late and ultimately cruised to a 5-0 victory over the Gallia Academy softball team Wednesday night in a non-conference matchup at the Eastman Athletic Complex in Gallia County. 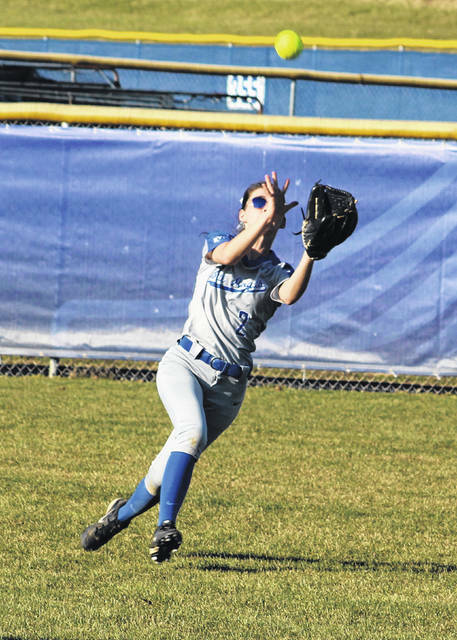 The host Blue Angels (0-3) produced five hits and benefited from two AHS errors, but the Blue and White were unlucky in the scoring department after stranding nine runners on base. The Lady Bulldogs, conversely, pounded out seven hits and stranded 11 runners, but the Green and Gold also made the most of some opportunities while gradually extending their lead. Scoreless through two complete, Brannan started the top of the third by getting hit by a pitch before stealing second base. GAHS followed with back-to-back strikeouts, but a pair of wild pitches allowed Brannan to slide home safely for a 1-0 edge. Casto later singled home Tenoglia for a two-run cushion midway through the third. Toppercee delivered a two-out single in the sixth that plated Kish for a 3-0 edge, then an error, two singles and a bases-loaded walk allowed Athens to tack on two more in the seventh while completing the five-run outcome. The Blue Angels had more than their fair share of chances, but the hosts left runners stranded in scoring position in the first, second, third, fourth and seventh frames. Stewart was the winning pitcher of record after allowing five hits and a walk over seven scoreless innings while striking out three. Hunter Copley took the loss after surrendering five runs (four earned), seven hits and seven walks over 6⅓ frames while fanning five. Abby Hammons paced the Blue Angels with two hits, followed by Copley, Chasity Adams and Bailie Young with a safety apiece. Kish led AHS with three hits, followed by Casto, Kaiser, Orcutt and Toppercee with a safety each. Casto, Kish, Orcutt and Toppercee also drove in a run apiece. Gallia Academy returns to action Monday when it opens Ohio Valley Conference play with a 5 p.m. contest at Ironton.